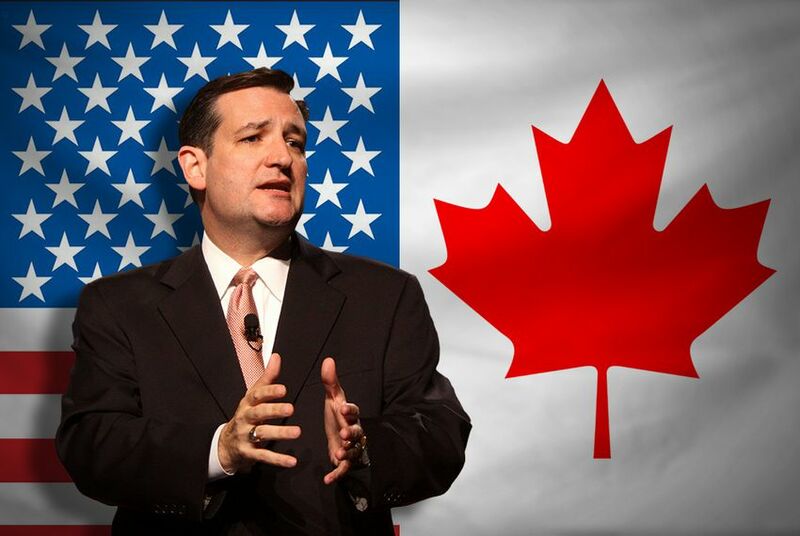 Texplainer: Could Canadian-Born Ted Cruz Be U.S. President? After Ted Cruz's win in the Republican U.S. Senate primary, his name is being thrown around as a future presidential candidate. But is the Canadian-born Cruz eligible to run for the United States' highest office? Hey, Texplainer: Ted Cruz is so hot right now, some people are saying he could run for president. But Cruz wasn’t born in the U.S., so how does that affect his ability to run for the highest office? Since Ted Cruz won the Republication nomination for U.S. Senate on July 31, columns have been written about Cruz as a potential presidential candidate in 2016 or beyond — and whether the circumstances of his birth may preclude him from some day running for the highest office. Cruz was born in the Canadian city of Calgary, Alberta, on Dec. 22, 1970. He is the son of a Cuban-immigrant father and an Irish-American mother from Delaware. At the time of his birth, Cruz's parents were in Canada working in the oil industry. Both of his parents attended college in Texas and returned here around the time Cruz was 4 years old. In some ways, Cruz’s story is similar to that of the two candidates who ran for president in 2008, Barack Obama and John McCain. And, like some people are already doing with Cruz, both Obama and McCain had their eligibility for president questioned. As with those candidates, constitutional experts say that there could be a candidate Cruz. “He almost certainly was a citizen at birth. I think that he would be eligible for the presidency,” said Peter Spiro, a professor of constitutional law at Temple University. Article 2 of the Constitution lays out the three minimum requirements for a person to be the president of the United States. Cruz is 41 years old, and has been a Texas resident for well over 14 years. The sticking point, says Brandon Rottinghaus, a professor of political science at the University of Houston, comes from what the definition of a “natural born citizen” is, and whether Cruz’s Canadian birthplace is addressed by the law. Rottinghaus said that the writers probably meant to include both people born on U.S. soil and those born to citizens, but ultimately left the decision to be made by the states. The Naturalization Act of 1790, passed by the First Congress, reads that any person "born beyond the sea or out of the limits of the United States, shall be considered as natural born citizens." The Nationality Act of 1940 outlined which children became “nationals and citizens of the United States at birth.” The law stated that a person is a U.S. citizen if he or she were born in United States; born outside the U.S. to parents who were both citizens; found in the United States without parents and no proof of birth elsewhere; or if a person has been born to one American parent, provided that parent has spent a certain number of years in the United States. The single-American parent requirement has been amended a few times, said UCLA law professor Eugene Volokh. As it applies to people born between 1952 and 1986, they must have a parent who was a U.S. citizen for at least 10 years, including five after the age of 14, in order for the baby to be considered a natural-born citizen. So how does all of this apply to Ted Cruz? Cruz’s father, Rafael Cruz, came to the U.S. in 1957 to study at the University of Texas. He did not become a U.S. citizen until 2005. Cruz’s mother, Eleanor Darragh, was born in Delaware and later moved to Houston. She graduated from Rice University in 1956. By virtue of being born in the United States, she is a citizen. Because she spent most of her life before Ted Cruz was born in the U.S., he also qualified as U.S. citizen at birth. Spiro said it’s possible that a person could challenge that the laws granting citizenship at birth do not define what it is to be a natural-born citizen. In fact, the phrase “natural-born citizen” is only used once in the U.S. Code — in Article 2 of the Constitution. Such a challenge would be unlikely to change the current definitions, however, he said. What about those other guys? Cruz’s situation probably falls somewhere between Obama and McCain in terms of how complicated they are to explain. Obama was born in Hawaii in 1961, two years after Hawaii became a state. His citizenship is spelled out by the 14th Amendment. Cruz was born outside the U.S., but according to rules set out by the U.S. Code, he was a U.S. citizen from birth. McCain was born outside the U.S., but not in another country — the Panama Canal Zone was an unincorporated U.S. territory in 1936. Legal theories differ on how that affected his eligibility. McCain was also born before laws were passed granting citizenship at birth to babies born in the Panama Canal Zone. For what it’s worth, Congress in 2008 passed a nonbinding resolution declaring that McCain was eligible to run for president, and a lawsuit challenging McCain’s eligibility in 2008 filed New Hampshire was thrown out for lack of standing. Bottom line: Despite being born in Canada, Cruz can be considered a natural-born U.S. citizen because his mother was also a U.S. citizen who lived in the United States long enough for him to qualify, according to constitutional experts. *An earlier version of this story said that Eugene Volokh and Ted Cruz were college classmates. They were not. They have known each other since the 1990s.